Kazuri Beads make beautiful hand made ceramic jewellery and pottery. Kazuri provides employment for around 400 women, many of them single mothers. If you are visiting Karen Blixen's house in Karen, Kazuri Beads is on part of the old estate - a tour of the different processes is available. Another source of employment for single mothers and disadvantaged women, this time from the Kibera slums. 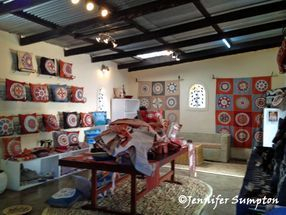 Woodley Weavers make carpets, wall hangings, curtains, bedding and table cloths using environmentally friendly dyes. 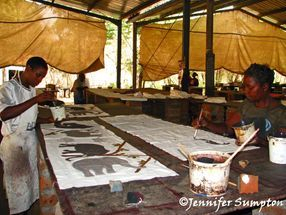 Tribal Textiles is on the road from Mfuwe Airport to the South Luangwa National Park. Truly beautiful hand made textiles using natural fibres and dyes providing employment for the local people. Take an informative tour before trying to decide what to buy.